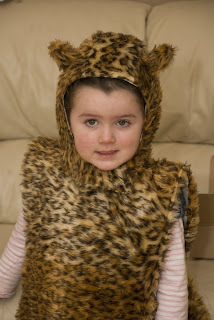 Alexandra's Wishes: Lions and Tigers and Bears! Oh my! Not too many then! Up until now, I've mostly been sticking to fur tabbards for the bodies, and avoiding starting anything that resembles a head because it's far more fiddly. Today though, I have been sewing the leopards heads. Well I had to start them at some point and I've already made the leopard bodies so at least it will mean 2 completed costumes. Alex thinks it's great because the living room is filled with fake fur, Rob is thinking it's not so great because our living room really isn't very big. Added to the mounds of fake fur are piles of DIY tools and materials. We only moved to this house in September and we've been giving it a major overhall. When I say we have been giving it a major overhall, perhaps I should clarify, I mean Rob has been giving it a major overhall, whilst I have been planning the next big job and generally getting in his way! The house is very different to when we moved in back in September, and it's a huge ongoing project, so you may hear more about that now and again. I've been playing with a bit of crochet too. I haven't been crocheting for long and I'm still learning really, but I do enjoy it. I find it relaxing. So, to wind down or fill little snippets of time recently (I even keep an ongoing one in my work bag just in case! ), I've been making little bags for Alex. I don't see any reason why she would need as many bags as she now has, but I don't seem able to stop! 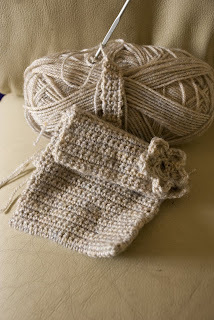 The first thing I ever crocheted when my nana taught me last year, was one of these little bags. My bag crocheting might be getting a little out of hand though. Rob keeps calling me the bag lady. FIRST TIME VISITING YOUR LOVELY BLOG! WOW! YOU ARE SO T.A.L.E.N.T.E.D! OH! BY THE WAY... A BIG AND WARM WELCOME TO BLOGLAND!